DWCompact models adopt the rotor technology with capacities from 20 to 280 mc/h and allow the operator to manage the loading of the hopper and processing machine. A sophisticated microprocessor control together with a loss-in-weight system guarantee an ideal process, while a color touchscreen repre- sents an easy operator interface. 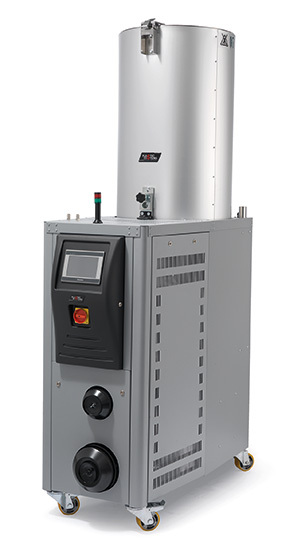 The DWC series is a perfect solution for all the different dehu- midification fields, including the most specific ones, such as electronic optical and medical fields. • Control of airflow with inverter. • Integrated hopper & processing machine feeding. • Database of standard/customizable materials. • Material level controlled by a weighing system. • Programmable operating times. •Modular system. • Hopper loaders for DWC. • Multi-Touch DWC for remote control. Constant monitoring of performances with actual consumption values during the working process. It reads the consumption of the processing machine and adjusts to the throughput. The operator simply selects the material from a database. 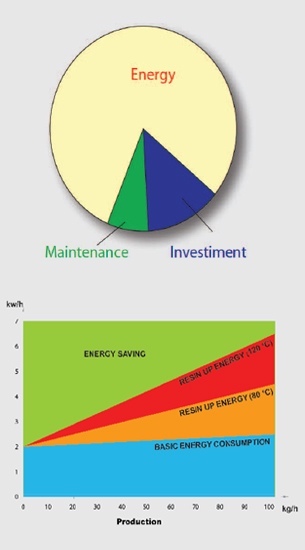 Energy consumption is the major cost in the life cycle of a machine, so the right choice ensures a return on investment and a higher margin of profit on the finished product. The most innovative dehumidification technology: energy saving and environment friendly at the same time.